FILE - Russian President Vladimir Putin explains the Brexit vote result by saying that "people are dissatisfied with the decision of the security issues that have sharply deteriorated in the face of strong migration processes. People want to be more independent." Russia reacted to Britain’s vote to exit the European Union with a mix of pleasure, understanding and concern. Some Russian politicians celebrated the Brexit, taking aim at the EU and its Western allies. 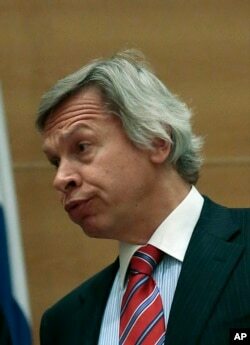 FILE - Senior Russian lawmaker Alexey Pushkov, seen speaking in parliament in May 2013, sees Brexit as reflecting a "crisis in the EU governance model" and calls it a "personal failure" for President Barack Obama. Obama, and other Western leaders, had urged Britons to vote to stay in the 28-member regional grouping. The Kremlin’s efforts to disrupt European unity and Russian state media’s fomenting of euroscepticism have led many analysts to conclude that Moscow favors the Brexit choice. "Nobody wants to feed and to subsidize weaker economies, provide for other states, for whole nations — this is an obvious fact,” said President Vladimir Putin in comments explaining why he understood the Brexit vote. “People are dissatisfied with the decision of the security issues that have sharply deteriorated in the face of strong migration processes. People want to be more independent." The Kremlin views the Brexit as weakening both the EU and the Euro-Atlantic alliance with the United States, said Ilya Kravchenko, an expert for the Russian International Affairs Council. Some Russian officials raised hopes that without Britain’s strong support for sanctions against Russia in the EU, the punitive measures over its actions in Ukraine might be softened. FILE - Moscow Mayor Sergey Sobyanin thinks that “without Britain, the EU will have no one so zealously upholding Russia sanctions." 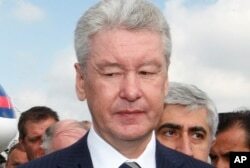 “Without Britain, the EU will have no one so zealously upholding Russia sanctions,” Moscow Mayor Sergey Sobyanin tweeted. Ukraine's President Petro Poroshenko expressed hopes that sanctions would continue against Russian aggression. Sanctions relief will not come sooner because of Brexit, Kravchenko said, because secession is going to be a years-long process. “Meanwhile, Russia’s actions in Ukraine are viewed by an absolute majority of the EU members as crucial for European security today, not in a couple of years,” he said. Latvia's Foreign Ministry said it regretted the vote but vowed to maintain close relations with Britain and protect its national interests. Estonia’s Foreign Ministry called the British “No to the EU” decision a “great loss” that would impact the economy. But in a statement, the ministry said there was no impact on Britain’s contribution to security as a member of the NATO military alliance. The Russian president acknowledged that Brexit would undoubtedly have consequences for the world and Russia. Russia’s concern was stability and predictability in Europe, said the Kremlin’s spokesman as both were being brought into question on Britain’s vote. Russia’s currency and stocks took an expected hit as markets dropped worldwide. Putin said markets would recover in the midterm. 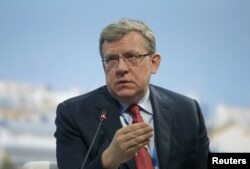 Moscow is expecting a chain reaction that might follow the secession of Britain from the EU and is well aware of right-wing populist parties in France and Holland scoring points from Brexit, Kravchenko said. In the Russian capital, Sergei Shust, a logistics manager, said it would be better for everyone if the U.K. stayed in the European Union. Other Russians on the streets of Moscow disagreed. Librarian Lena Vasilyeva welcomed the vote for Brexit.